It's great to be able to get out on the hills with the radio gear. Ideally we want a small and light weight station if we are to go backpacking to high places. Telescopic rod antennas are attractive for portable low power use as they are small, light weight and can be rapidly set-up. We describe here a very simple full-size wideband 6m dipole-based antenna that uses 4 telescopic rods. When folded up the antenna is very compact. The 6m band covers a wide range of frequencies. A dipole will work well over the band but in practice the SWR will only be suitable for use (with modern solid state transceivers) over a part of the band. An antenna tuning unit (ATU) can be used to match the radio to the feeder / antenna but at VHF some power loss is inevitable. Also if you are intending to go portable the ATU is another piece of equipment that has to be carried. Ideally then, for best results you want a full size wideband antenna that can be folded up to solve the problem - this is what we describe here. The frequency response of an antenna can be broadened by using thicker radiators (eg. metal tubing or sheet) but this has obvious disadvantages for portable work. Increasing the numbers of radiators can also broaden the response. The X-antenna is made up of four telescopic rods, wired in pairs to form an X-shaped broadband dipole. Joining the far ends to form a sort of 'bow-tie', broadens the response still further but in practice its added complexity means it is not so appealing or reliable in this application. In the course of designing the portable antenna described here I experimented with the 3 basic 'dipole' antennas (the dipole, X-antenna and the bow-tie) to see how they compared. 2 telescopic rods were used to form a standard dipole but were found to be too short to be resonant on the 6m band directly (see results table below). 4 telescopic rods were used to form the X-antenna (a slightly squashed X) where the rods were connected in pairs. Finally the X-antenna rod tip-ends were connected together (using a pair of 50cm croc-clip jumpers) to form the bow-tie shaped antenna. SWR measurements were used as a rough guide to see relative differences. In these simple experiments each antenna was tested in turn, placed in identical positions upon a tower (5m above the ground in a wide open space). The same coax feeder was used on each antenna, in turn, and measurements were made with an antenna analyser at the transceiver end of the antenna system. As the only experimental changes were with the antennas it was hoped that the SWR measurements would give useful relative comparisons between them. The two tables below show typical SWR measurements for the 3 antennas. They show the trend in the shift in resonance (a, b and c – where the reactance was very small) and the broadening of bandwidth of each of the feeder-antenna systems as one goes from the basic dipole, to the X-antenna and finally to the bow-tie. 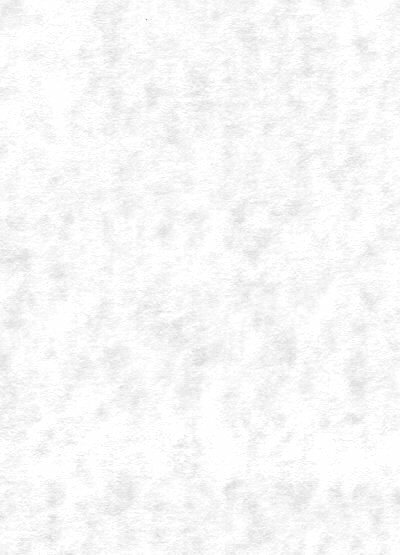 As an arbitrary comparison I chose the bandwidth quoted here to be the range over which the SWR was 2:1 or less. SWR measurements like these are used as a rough guide to show relative difference between the antennas. For our set-up the X-antenna showed a good SWR within the whole 6m band. 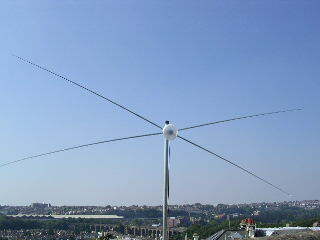 The other antennas could easily be adjusted to bring the SWR 'low' somewhere within the band. The experiments show that the simple dipole could not produce a good SWR over the whole of the 6m band but in comparison the X-antenna and the bow-tie performed well. The X-antenna response was broader and the resonance shifted down in frequency compared to the dipole. By varying the length and the angle between the rods one could readily adjust the resonance and the SWR. The bow-tie gave the broadest SWR response of all. Note: * extent of the 6m band world-wide. (a), (b) and (c) are the resonant frequencies (centre frequencies) of the 3 antennas (where the reactance was zero or very small). All antennas use the same length telescopic rods. The X-files - 6m, 4m and 2m ! As the X-antenna is so simple I tried experimenting with it for other bands. The telescopic rods used in the experiments have 10 sections, by varying the length of all 4 rods together one has a easy way of re-tuning the antenna for other bands. For example, with all the rods extended the full 10 sections, the antenna is resonant for 6m, with 7 sections extended (the narrowest ends being pushed in) it is resonant over 4m and with just 3 sections it covers 2m! This simple design would also form a very useful portable antenna for scanner receivers. Above: The simple wiring layout of the X-antenna. The 4 rods go through holes (grommet sealed) in a small round plastic box. The rods I used have 10 sections with a maximum diameter at the base of 9.5mm. When un-extended they are 16.5cm in length and 131cm when extended. The threaded base (M4) end of each rod were fitted into a short piece of 6cm diameter plastic pipe within the enclosure. This keeps the rods in position and makes the whole construction more rigid and secure than would be obtained simply by bolting the rods to the outside of the box. Solder tags were used on each rod so that good electrical connection could be made between the rod pairs as well as to the coax. The angle between the rods was about 30-40 degrees but there is room to experiment here. Above: view showing the central plastic pipe supporting the rods. The box was fitted with a single terry clip and a locating bolt. If a locating hole is drilled in the top of the mast to take the bolt, the antenna can be snapped in place extremely quickly. A butterfly nut can be used on the locating bolt to secure in place. 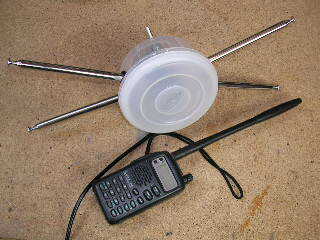 A small multi-section aluminium mast will carry the light load of the antenna. It might be possible to use the simple clip fastener to get the antenna to work by simply attaching it to a tree branch or perhaps a hill top trig-point. The impedance of an ideal dipole at resonance is close enough to 50 ohms to match directly into a transceiver. The X-antennas described here should work directly without adjustment if you follow the dimensions given. The rods need to be fully extended and the ideally the antenna mounted as high as possible above the ground, clear of obstructions. With a vertical mast one would expect the antenna to work best in horizontal polarisation. The X-antenna is simple and (when the rods are retracted) very compact - small enough to easily be put into a backpack for portable use etc. The antenna is designed for low power work and I suspect that the joints between the various telescopic rod sections will reduce efficiency at higher power. The antenna should work well with power levels up to a few watts. 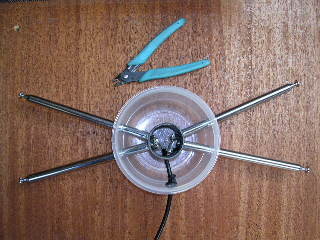 A simple balun can be made at the antenna end by coiling up 50cm or so of the coax to form a 4-5 turn coil. 5) 4 - grommets to fit rods, 1 - grommet to fit coax into box. 6) 5-10m of RG58 coax and suitable coax connector. All VSWR measurements were made on a MFJ-269 SWR antenna analyser and the antenna was mounted to the mast ca. 4m above ground level in a wide open space. Approximate cost of the X-antenna is about £15. Jonathan Hare would like to thank NESTA for support.